Today, I want to share this fantastic report by Daily Portal Z, which is a resource site for this blog. 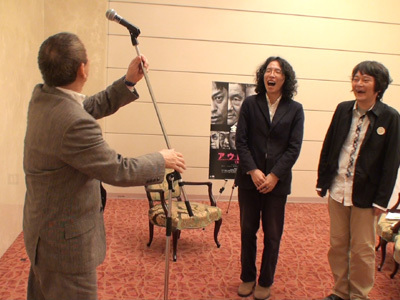 Amazingly, they interviewed with a famous Japanese film director, [W:Takeshi Kitano]! Not so long ago, his latest work “OUTRAGE” was released, and this interview is officially to promote this film; however, the interviewers’ main purpose was different. 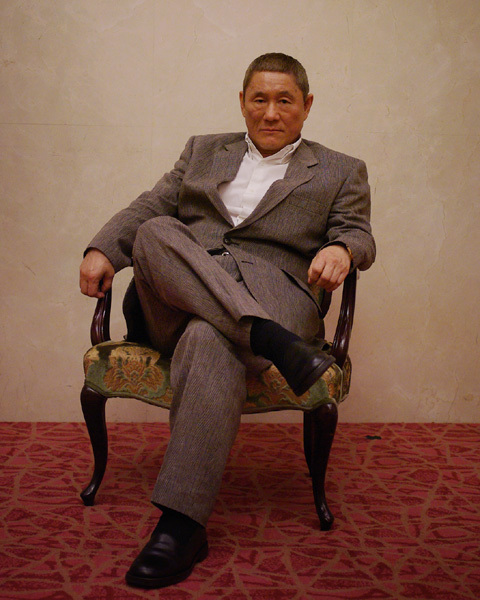 Kitano is a world known film director now but he was originally a comedian in Japan (he still hosts TV shows). He has been very successful as a comedian and has his popular comedy acts; stumbling, bumping his head on a microphone, and “komanechi”. 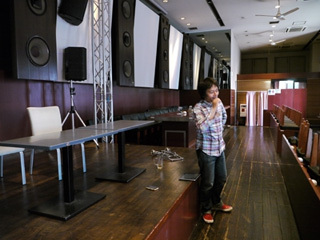 At the occasion, the blogger wanted to get some tips of his comedy acts from the comedian more than anything, so he practiced the acts at a studio. 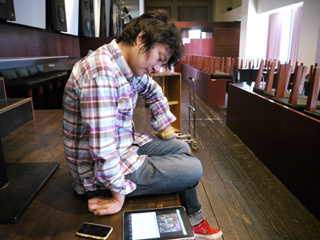 The blogger practicing stumbling at a spacious studio. 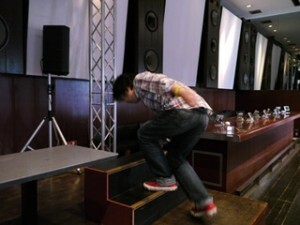 Making people laugh by missing his step. It isn’t so easy though. 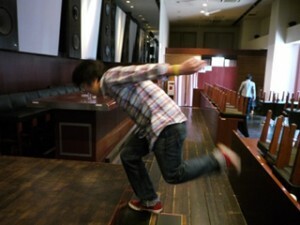 Anyway, he practiced a lot before the interview. 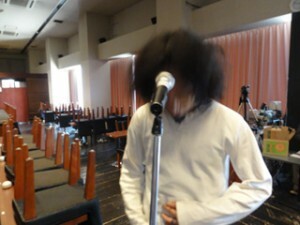 This is the microphone act. This act goes when he try to speak at a microphone, he hits his forehead on it. 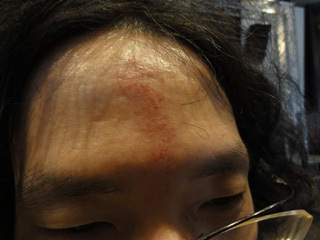 The blogger practiced hard till almost bleeding (LOL). Preparing for the interview. 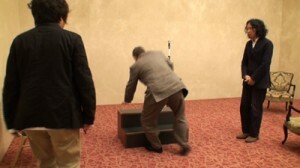 They didn’t forget to set steps and a microphone. 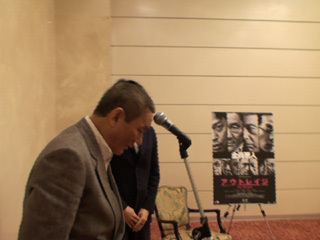 Waited for the director Kitano arrives. 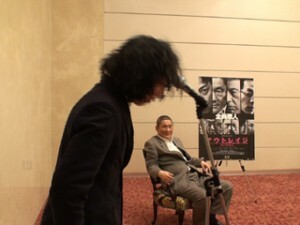 According to the blogger, contrary to his expectation, Kitano was gentle and listened to the interviews’ stories while showing his interest in them. 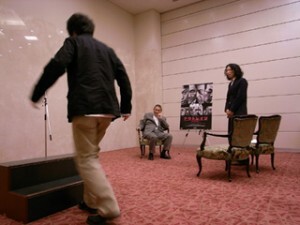 But there were more than 10 serious looking entourages including his manager, publicity man, and some important people standing behind the interviewers, and their silent pressure was powerful, like they were saying “Don’t ask him something stupid” silently to the interviewers back (LOL). The interviewers were watching for a chance to talk about the comedy acts. 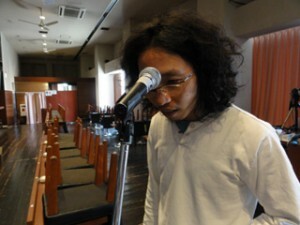 The blogger stood up to show what he got from the practice. Even though they knew it is an act, they got uneasy at him. Of course he is ok. The next one is the microphone act. 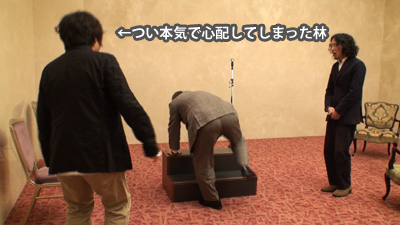 Oh, Kitano stood up again! I see. He hits his upper forehead! He is good at pretending to be pain. 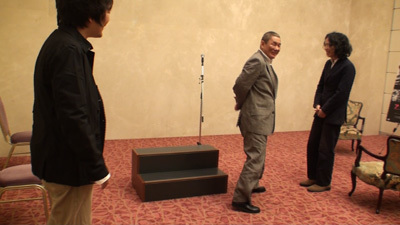 Kitano taught them another gag; setting microphone high for a short person. By the time, the atmosphere in the room got loosen up. The last but not least, “komanechi” !! At the end of the interview, they got his autograph. It made them really happy.